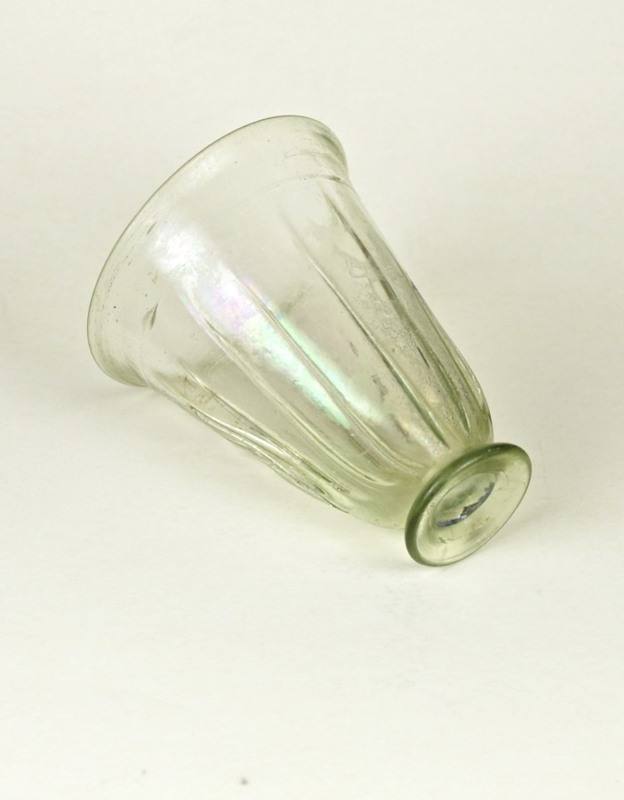 The beaker is made of colorless glass with a slight greenish tint and has a hint of iridescence. It was blown with ribs applied to the parison, inflated further and a thin trail applied below rim. The 15 ribs are straight with a very slight swirl. 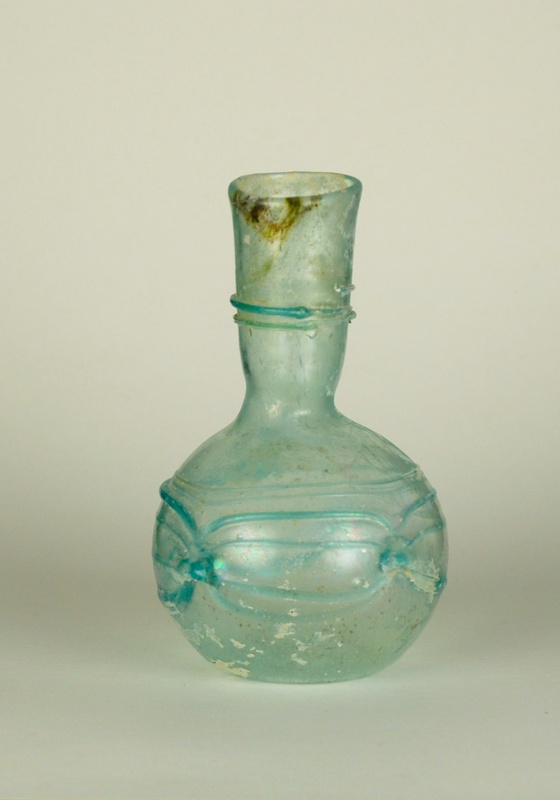 Remarks:This late Roman glass is a colorless pilgrim flask with blue handles. It is called this because of its flattened shape making it easy to slip into a bag carried by a traveler. 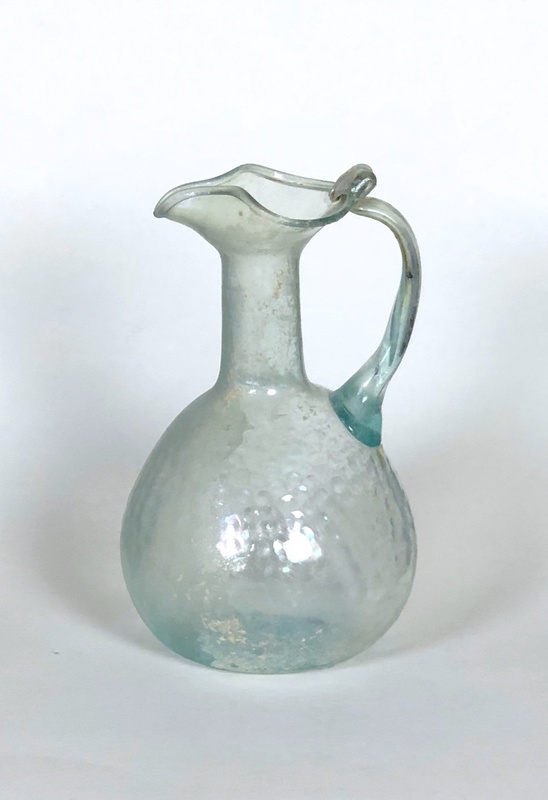 This is a Roman flask of colorless glass. It has a spherical body with a pushed-in bottom, a tubular neck constricted slightly at the base, and a rounded rim. Fine trails of aquamarine glass were wound around the neck and body, then crimped into a festoon pattern. This spectacle decoration was popular during the late Roman & Byzantine periods. Remarks:This small and delicate sprinkler flask was blown of pale aubergine glass. The bulbous body is decorated with six vertically pinched ribs tapering off near the bottom of the vessel. The plain narrow neck splays out at the rim, the thin lip edge turned under. No pontil mark. 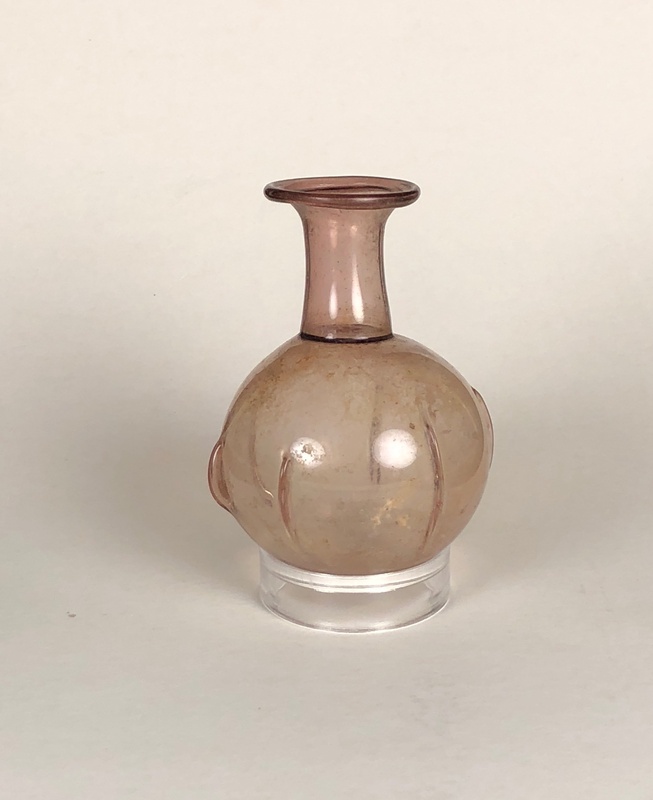 It is fairly common to find glass sprinkler flasks with pinched ribs from the Eastern Provinces and many have been classified as pomegranate-shaped. These often show tiny toes protruding from the base. 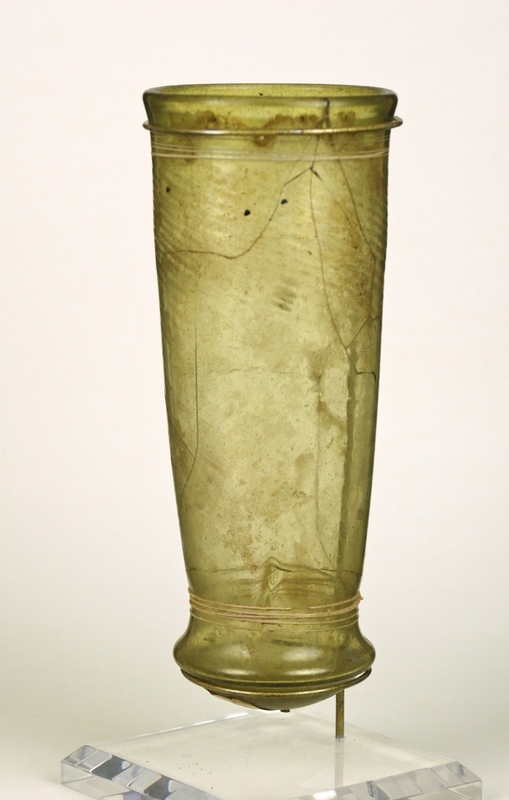 References: Roman Glass in the Corning Museum of Blass Vol. III, #1155, P.151, Ancient Glass, Charles Ede Ltd, May 1993 #3, Ancient Glass in the Israel Museum, 2003, #279, 280 P. 226, ( live link) Pomegranate Sprinkler from The Augustinus Collection on ancientglass.wordpress.com web site. Description: Pale aquamarine pitcher has a piriform shape widening out to the bottom. The concave base shows a pontil mark. The applied handle reaches from the shoulder up to the mouth ending with a single overlap. The faint dot decoration was formed by first mold blowing then removed and further inflated. 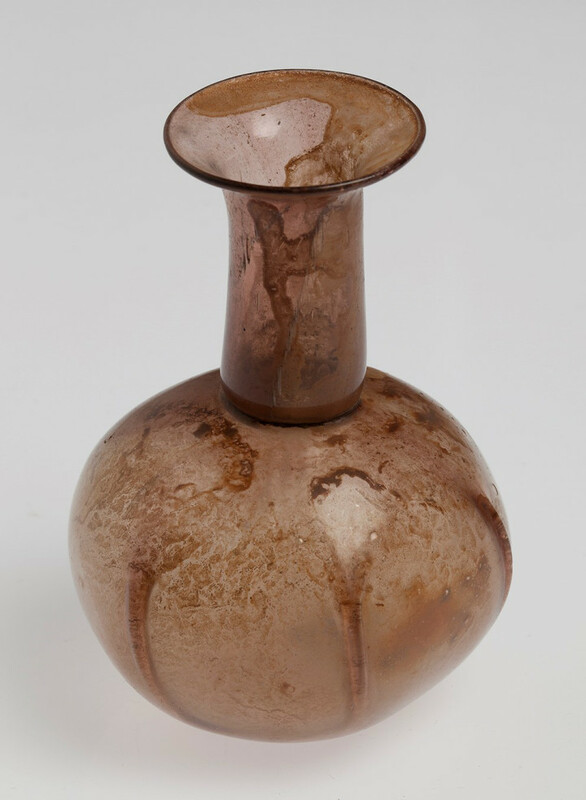 The earliest glass bottles were produced in Egypt, Syria, Greece and Cyprus as early as 1500 BC using the core forming techniques. 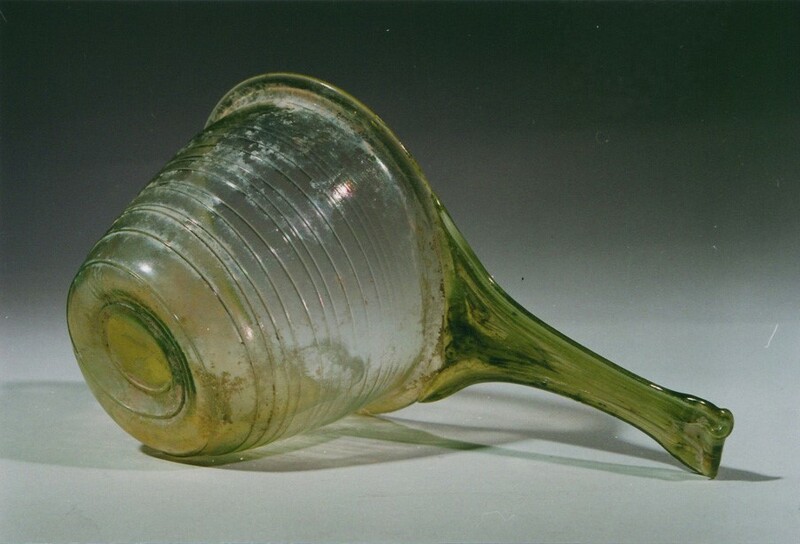 Around 50 BC, probably in Syria, the discovery of the blowpipe and the technique of glass blowing made the blown bottle possible. The following examples from the Allaire Collection of Glass illustrate various examples from 6 BC to 1850. To see all of the American glass bottles go to AMERICAN EARLY GLASS in The Allaire Collection. Description: Free blown dark blue glass hemispherical cup with high protruding rim and folded flange. Inside the rim the wall curves in creating a narrow ledge. Base ring no pontil mark. 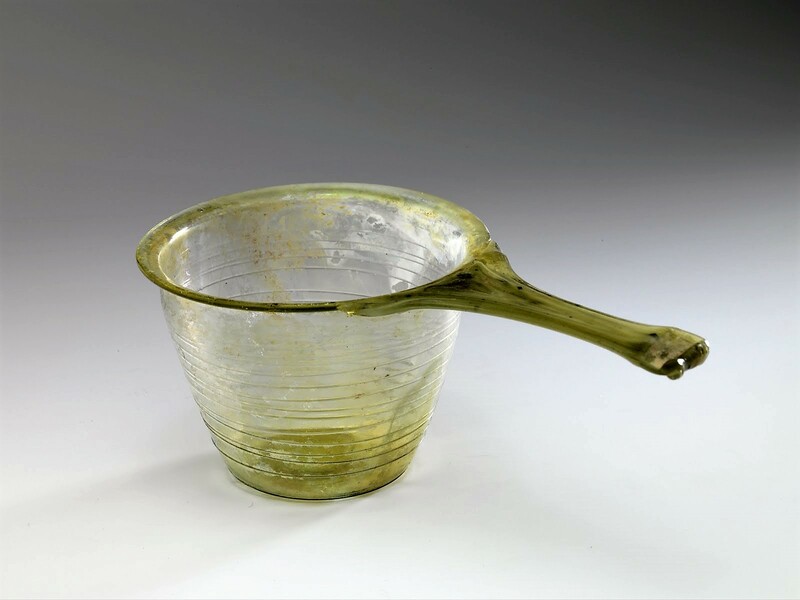 Remarks: Romans often drank a mixture of vinegar and water and had a special container for this called an acetabulum. This is from the Latin acetum (vinegar) and abulum the suffix denoting a small vessel. Today the word is used only as a medical term to describe the cup-like shape in your hip that the thigh bone sits in. Usually made of pottery, some in the first Century, as in this example were made of glass and often found in Italian graves. Below are three examples found on this site. Date: 1st to 2nd century A.D. | Isings: form: 42 a/b | Kisa: Formentafel G 417. 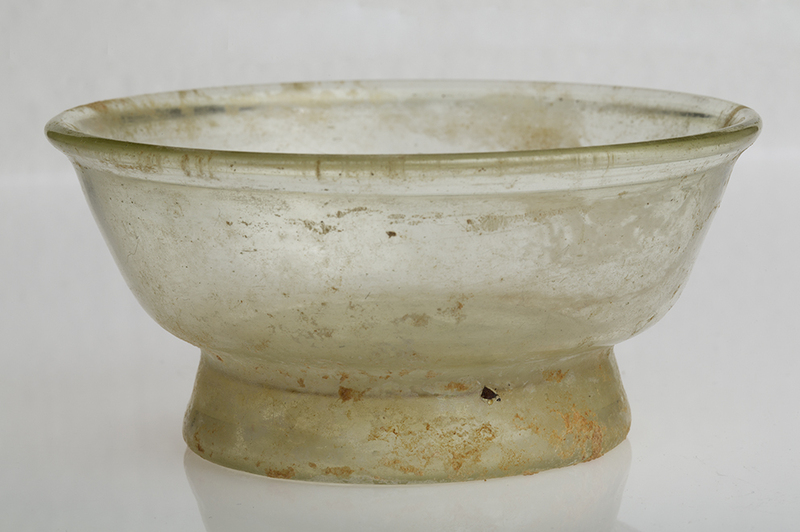 Description: Small bell-shaped bowl on heavy foot made of transparent glass; rim everted and folded down with rounded lip; base flat with high footring placed in a conical position, rounded as well; pontil mark visible. Technique: Free blown, rim everted, pushed down and rounded. with footring made by folding; slight constriction where body and footring meet. Condition: Complete with no cracks or bubbles, sign of time and adhering sand. Reference: Whitehouse, CMG vol II, no: 646, p 139, formerly in the Strauss Collection. Bomford Collection, Bristol Museum, no: 98, p 26. Called: a common Mediterranean type. Provenance: From a private dutch collection, previously unpublished. Description: Deep cup of thin yellowish-green color free blown. Handle with streaks of opaque white glass. Wall descends vertically then tapering to flat slightly hollowed base. Short flattish rim with reworked lip. Body decorated with a thin glass thread started from base in 16 revolutions from bottom left to upper right. Long flat horizontal ‘fishtail’ handle attached to lip, made of a drawn-out end, pinched out with pincer-marks on top and bottom, and loose end folded on underside; widening at attachment with lip. No pontil mark present.